First of all I would like to apologize because I have been MIA the past few weeks! The combination of a broken computer and starting a new job have kept me away from updating ForeverHungry, but certainly have not kept me away from food so there is plenty to catch up on 🙂 I wanted to highlight Maguro Sushi House today because it is a repeat sushi restaurant on our date night list! This sushi spot on Main Street in Ramsey is located where Sushi Yoshi used to be. They re-did the decorating inside and it’s really cute and welcoming. The staff is also extremely pleasant and part of the reason why we keep going back. The main reason however is their amazing sushi selection! The food is delicious. 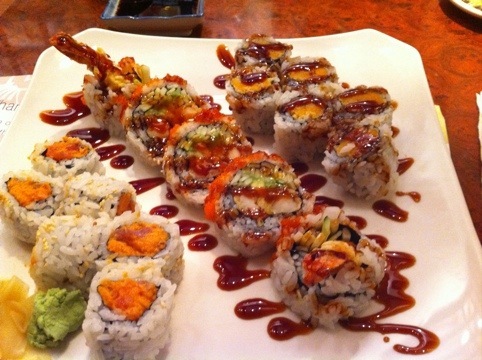 This picture is the Sweet Potato Roll, Shrimp Tempura Roll and Spicy Tuna. Classics, but seriously done right! Last night, I had the Shogun Roll- Eel, Spicy Tuna, Cucumber, Tempura Flakes and Jalapeno Caviar with Spicy Sauce. OK, I didn’t have it exactly like that, I substituted the cucumber for avocado and nixed the jalapeno caviar, but it was out of this world 🙂 I always like to try a new roll but this might be something I stick with for a while.